My recollections of the Technology Review holiday party, which took place yesterday, are a whirl of awkward shouted conversations, blurred vision and an embarrassing incident where I ran into a wall. Fortunately that’s only because I was attending as a robot rather than in person. The party took place in Cambridge, Massachusetts, while I was sat safely in my office in San Francisco, California. 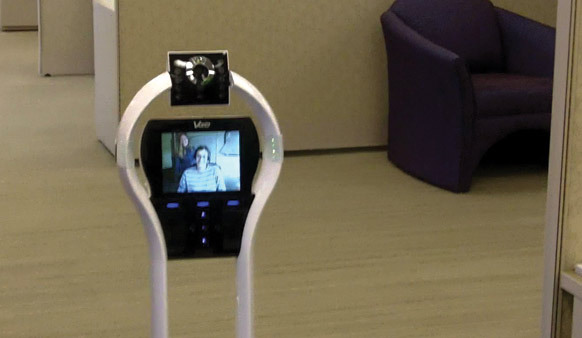 My electronic avatar was made by VGo Communications, one of a handful of telepresence robots aimed at businesses as an alternative to travel. During my short time trying out the robot I’ve found it has helped me feel more connected to my colleagues thousands of miles away. Using it to attend a party, though, highlighted some of the social challenges that telepresence robots face in any situation (read my longer piece in our latest issue for more on this). Our elastic sense of personal space posed one of the biggest problems. At a crowded party people get more cosy, and that seems to apply to robots too. Unfortunately the robot is only around four feet tall, and has a camera with a relatively narrow field of view. Even though I could tell that I was in a group conversation, I could only see one person at a time, from the viewpoint of a child, a strange experience for someone who stands 6 feet tall. Threading my way around the crowed party without bumping into things was a challenge I didn’t master. Talking was made difficult because when you’re a robot you miss out on human brain’s powerful Cocktail Party Effect that can pick out a single voice from the hubbub of many others. The robot’s multiple microphones delivered voices from all angles into my ears at high quality, something that’s valuable in the boardroom, but confusing at a party. The combination of background chatter and the people I wanted to hear talking over one another or to people passing by made for a dense wall of sound. The best social interaction I had at the party was with a child of around five years old. Not only was she much closer to “my” eye level, but unlike a grownup she was also happy to devote her entire attention to our conversation and ignore everyone else. She also seemed to find it less of a novelty to be talking to a robot—indeed she wasn’t interested in talking about my odd appearance at all. Although I could get used to occasionally becoming a robot for business purposes, perhaps partying as one is best left to a younger generation.